Biloxi is both one of the oldest and youngest Jewish communities in Mississippi. While the first sign of organized Jewish life dates from the 1850s, Biloxi did not have a Jewish congregation until the 1950s. Biloxi and the rest of the Gulf Coast region are somewhat of an anomaly in Mississippi; their history has more in common with other coastal cities like Mobile and New Orleans than it does with the rest of the state. The French first settled Biloxi in 1699, and for a short time it was the capital of French Louisiana. Today, Biloxi and its next door neighbor Gulfport are the central population center of the Mississippi Gulf Coast. The earliest sign of a permanent Jewish settlement along the Mississippi Gulf Coast was the creation of a Jewish cemetery called “Hebrew Rest” in 1853. Located on Reynoir Street in Biloxi, and not used for years, this cemetery was purchased by Jews in New Orleans, most likely the Gates of Mercy Synagogue. Frederick Reynoir deeded the land to L. Klopman of the “Hebrew Society of the City of New Orleans to be used as a burying ground until there shall be a synagogue in Biloxi.” Gates of Mercy already had a cemetery in 1853, and the most probable explanation for their purchase was that year's yellow fever epidemic in New Orleans. During the outbreak, many of the city’s residents fled to safer areas, including places like Biloxi. Thus, the congregation likely purchased Hebrew Rest cemetery for Jews who fled New Orleans but died in Biloxi. Though there is some variance in the estimated use of the cemetery, most figures approximate the number buried at Hebrew Rest to be between 10 and 20. By 1916, the city took control of the abandoned land of Hebrew Rest. When the city widened Reynoir Street, they planned to move many of the tombs to the naval reserve. The city issued notice to the families of Cecile Schwartz, Oury Bernard, Aaron Cohen, Mrs. Mathilda Harnthal, Henry Lyons, Lazarius Leopold, Brandly Friedlander, and Michel Levy, warning them of the possible displacement of their family graves, though it is unclear whether these graves were ever disinterred. During the several decades after the founding of the cemetery, a few Jewish families lived on the Gulf Coast but never in enough concentration to form a congregation. Most of these Jews owned retail stores. In 1908, the local newspaper noted that there would be no Jewish services for the high holidays in the area since there was no congregation, though "doubtless, Jewish people living here will celebrate the day quietly in their homes." The handful of Jewish-owned stores in town, including Picard's Emporium and David and Maurice Levy's stores, did close for the Jewish holidays that year. As late as 1937, only 41 Jews lived in Biloxi/Gulfport. During the 1930s, Jews owned at least three stores in Biloxi, including a furniture store owned by the Cohens, a ladies’ clothing store owned by I. B. Rowe, and the Rosenbloom Clothing Store owned by James Rosenbloom. Those who wanted to worship with a congregation traveled to either New Orleans or Mobile to attend synagogue. World War II was a watershed event for Biloxi and its Jewish community. The opening of Keesler Air Force Base brought new life to the Jewish population of Biloxi, as well as vigor to the economy. With the arrival of new Jewish residents, there was a growing desire for organized worship. New arrivals such as Abe Silver were the catalyst in the founding of Congregation Beth Israel. Silver arrived in Biloxi to work as an electrician on the base and served for many years as a lay leader, leading Shabbat and High Holiday services and conducting weddings and funerals. Other Beth Israel members lured to Biloxi by the base included Charles Gottesman, Fran Leitner, Zelma Feldman, and Len Fishman. In 1958, the congregation received its official charter and finally acquired a synagogue. Moody Grishman was a leader in the consolidation of the Jewish community in the 1950s. He found the site for Beth Israel’s synagogue. In his youth he began farming on a forty acre farm in Gulfport, raising milk cows and chickens as well as producing onions, pecans, and vegetables. His work farming, which lasted from 1930 to 1939, made him perhaps the only Jewish farmer in the region. After his foray into farming, he went into the insurance business, which he quickly abandoned in favor of becoming a salesman for Sazerack Company, a wholesale liquor provider. He eventually went into the real estate business. He married Elizabeth Calendar Grisham and had four children, only one of whom remains in Biloxi today. In 1953, local Jews established a B’nai B'rith chapter, which served to unite a Jewish population scattered among such coastal towns as Biloxi, Gulfport, Long Beach, and Pacagoula. 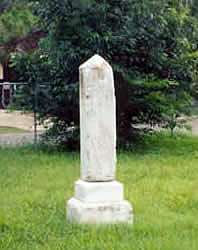 One of their early projects was an effort to restore the old cemetery. They faced a difficult project; the cemetery had been severely desecrated, and some of the tombstones were even being used as doorsteps throughout Biloxi. The preservation effort was further disrupted when Elder Street was built on top of the cemetery site, cutting directly through the burial grounds. In response, the Beth Israel Congregation built a fence around the site to demarcate it from the surrounding forest, and a historical marker was erected to commemorate the cemetery. 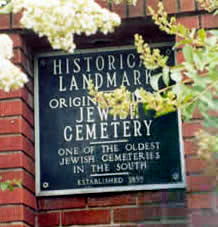 The marker read: “Original Biloxi Jewish Cemetery, One of the oldest Jewish Cemeteries in the South, established 1855.” Successes of this venture include the restoration of the grave of Michel Levy. Levy, who had been born in Paris, France, had lived in Biloxi only three months before he died of “bilious remittent fever” at age 17 and was buried in Hebrew Rest. The Gulf Coast B'Nai B'rith was also engaged with the larger Gulf Coast community—in 1969, when Hurricane Camille decimated the Mississippi coast, the Gulf Coast B’nai B’rith lodge raised money for the recovery effort and donated a mobile headquarters to the Salvation Army and Red Cross to aid in the clean up. The Gulf Coast Jewish community remained small, but close-knit through the 1980s. Biloxi/Gulfport had about 100 Jews in 1984. In the 1990s, the area was transformed yet again by legalized gambling. Large casinos and hotels covered the beaches in Biloxi and Gulfport. The new tourism business attracted Jews from other parts of the country to the Mississippi coast. Steve Richer came from New Jersey in the 1990s to become the executive director of the Mississippi Gulfcoast Convention & Visitors Bureau. He eventually became president of Beth Israel and led the congregation during the hardships of Hurricane Katrina. In 2001, 250 Jews lived in the area. At the time of Hurricane Katrina in 2005, the local Jewish community was still growing. The storm brought unprecedented destruction to the coast, and the Jewish community suffered its share, with the loss of its synagogue. In 2009, Beth Israel dedicated a new synagogue in Gulfport. The Jewish community's future health will likely mirror that of the area itself.